This was a very interesting term for me because I moved away from the methods I was investigating in Term 1 and, using a similar area of interest, tested a more open-ended but also focussed way of exploring that territory. The crux of my exploration was around interrelations between the macrocosm and microcosm, symbolic relationships between planetary bodies and their associated metals, the interplay between the attributes we ascribe to the planets, the attributes they reflect back at us and the way we interact with that. It’s a bit of a web going backwards and forwards, in and out without a real resolution but just creating open-ended questions. I was also working to steer away from ‘exclusionary subject matter’ and make the work more accessible and less (potentially) confrontational. I believe I achieved this – gauging viewers reactions to the work – by divesting the work of all marks and symbols and by presenting it in a more clinical, scientific manner. After delving into the subject of ‘performative spaces with boundaries’ I feel that a clinical and scientific presentation also achieves this level of containment and safety for the viewer. Finish – Look at the finish (particularly pertaining to the large, white objects). Can flaws be incorporated? Expanded upon? An integral part of the work? How do accidental happenings effect the work? The work needs to be either more imperfect or more perfect and I need to know what this means for the outcome. Perspectives – being able to see inside the objects, viewing from different angles, interior/exterior views, the objects invite the viewer to walk around them and view inside. What doe these things mean? How can they be utilised? Shapes and Size – look at multiples, stacking, arranging. What happens if the objects become larger or smaller? How will we relate to them? Materials – examine the use of materials, how they can combined. 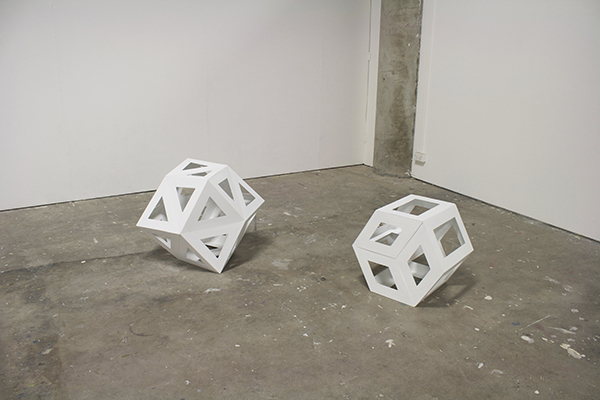 Could the large objects contain elements of the interactions present in the ABRAXAS piece? Display – how do the objects work in the space? How do they interact with the floor and the markings on the floor. I had a realisation that I was working within areas of transformation and thresholds, which is something I was interested in way back during my second year of my BFA, but which I had trouble articulating at the time. Transformation includes ideas around movement, change, alchemy, hiding/revealing, so my challenge is to bring those into my work more strongly as well as looking at working with materiality and they way that effects the work. Posted on 08/29/2014 08/29/2014 by marymacgregorreidPosted in Contemporary Art Practice, Critique, EsotericTagged contemporary art, critique, Esoteric.